Is Santa making an appearance at your next party? Are you looking for a unique way to get your guests into the holiday spirit? Why not rent Santa�s Cozy Sleigh! Make your visit from Santa even more magical with this realistic and classic looking sleigh! Whether you are using it as a photo prop, a holiday party decoration, or for the jolly man himself, our Santa�s Cozy Sleigh is the perfect addition to your next holiday gathering. Our Santa's Cozy Sleigh in red is a perfect indoor prop for malls, storefronts, and large display windows for Holiday decor. 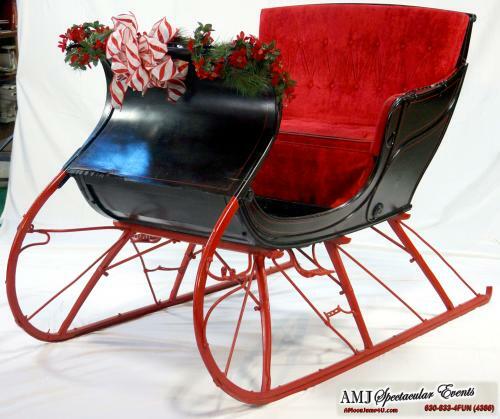 This sleigh is great for taking photos with Santa at Holiday Open Houses and other Holiday events. Please call for pricing and availability. Size :8' x 40" x 42"